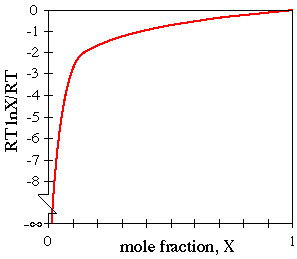 mole: 1 mole of a substance contains Avogadro's number (N = 6.02E23) of molecules. Abbreviated as 'mol'. The Celsius scale is based on defining 0 °C as the freezing point of water and 100°C as the boiling point. 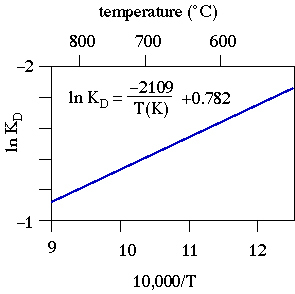 The Kelvin scale is based on defining 0 K, "absolute zero," as the temperature at zero pressure where the volumes of all gases is zero--this turns out to be -273.15 °C. This definition means that the freezing temperature of water is 273.15 K. All thermodynamic calculations are done in Kelvin! kilo and kelvin: write k for 1000's and K for kelvin. Never write °K. Joules and calories and kilocalories: A calorie is defined as the amount of energy required to raise the temperature of 1 g of water from 14.5 to 15.5°C at 1 atm. 4.184 J = 1 cal; all food 'calories' are really kcal. Think about some everyday experiences you have with chemical reactions. Your ability to melt and refreeze ice shows you that H2O has two phases and that the reaction transforming one to the other is reversible--apparently the crystallization of ice requires removing some heat. Frying an egg is an example of an irreversible reaction. If you dissolve halite in water you can tell that the NaCl is still present in some form by tasting the water. Why does the NaCl dissolve? Does it give off heat? Does it require energy? How is it that diamond, a high-pressure form of C, can coexist with the low pressure form, graphite, at Earth's surface? Do diamond and graphite both have the same energy? If you burn graphite and diamond, which gives you more energy? When dynamite explodes, why does it change into a rapidly expanding gas, which provides the energy release, plus a few solids? Chemical thermodynamics provides us with a means of answering these questions and more. A system is any part of the universe we choose to consider. Matter and energy can flow in or out of an open system but only energy can be added to or subtracted from a closed system. An isolated system is one in which matter and energy are conserved. A phase is a homogeneous body of matter. The components of a system are defined by a set of chemical formula used to describe the system. F + P = C + 2. Extensive parameters are proportional to mass (e.g., V, mass, energy). Intensive parameters are independent of mass (e.g., P, T); these are the "degrees of freedom" F contained in the phase rule. Thermodynamics allows you to predict how chemical systems should behave from a supra-atomic "black-box" level--it says nothing about how chemical systems will behave. Thermodynamics also pertains to the state of a system, and says nothing about the path taken by the system in changing from one state to another. How to write chemical reactions; stoichiometry. Thus, if the products are smaller than the reactants, rV < 0.
where i are the stoichiometric coefficients, positive for products and negative for reactants. What Actually Drives Reactions? Is it Energy? Can We Just Calculate or Measure the Energy Difference of Reactants and Products and Know Which Way the Reaction Will Go? For many years people felt that chemical reactions occurred because the reactants had some kind of energy to give up (i.e., use to do work)--and that therefore the energy of the products would be less than the energy of the reactants. However, we all know that when ice melts it consumes rather than releases heat, so there must be more to the story behind why chemical reactions occur. "If a change is made to a system, the system will respond so as to absorb the force causing the change." A mechanical analogy for chemical change is that of a ball rolling down a slope with multiple valleys; we explain the ball's behavior by saying that mechanical systems have a tendency to reduce their potential energy. At equilibrium none of the properties of a system change with time. A system at equilibrium returns to equilibrium if disturbed. "Stable" describes a system or phase in its lowest energy state. 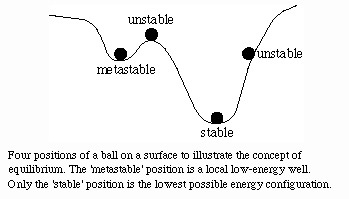 "Metastable" describes a system or phase in any other energy state. The figure above shows the mechanical analogy for H2O at -5°C and + 5°C and 1 atm. Left: at -5°C, solid H2O has the lowest possible energy state. 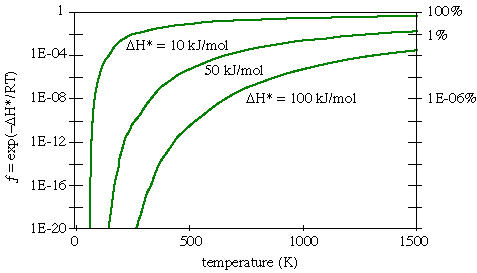 Right: at +5°C, liquid H2O has the lowest possible energy state. When solid H2O is actually present at +5°C, the difference between the free energy of solid H2O and liquid H2O is available to drive the reaction to form the stable solid H2O phase, and the reaction will go to completion if kinetically possible. Energy: How Do We Calculate and Measure Energy and How Can We Use this Knowledge to Predict Reaction Behavior? so that a decrease in volume - V is seen as positive work or that an increase in volume + V results in a decrease in crystal energy. The absolute energy of a body can be calculated from Einstein's equation U=mc2, but the presence of the c2 term means that the energy of any system is quite large and that measuring this energy is impractical. It is more practical to measure differences in energy U, and we always discuss or measure differences relative to some arbitrary standard state. Analogous to this might be if someone in Namibia asked you to measure the elevation of the crests of waves at Campus Point--without agreement on some kind of standard, you wouldn't be able to do much more than measure the heights of individual waves. If however, you could both agree on an equivalent "sea level" at both localities, you could then compare the absolute elevations of the wave crests. A typical thermodynamic standard state is normal laboratory conditions: 25°C (298.15 K) and 1 atm (often called STP for standard temperature and pressure). The internal energy U of a mineral is the sum of the potential energy stored in the interatomic bonds and the kinetic energy of the atomic vibrations. Thus, you might expect that weakly bonded minerals have relatively low potential energy and thus low internal energy, and when a mineral is cold such that its atomic vibrations are slow it will have low kinetic energy and thus low internal energy. Internal energies are always defined relative to some non-zero standard state, so we typically talk about changes in internal energy dU. What's the difference among , d , and ? is used to indicate any kind of difference. d is used to indicate a differential. This is effectively the First Law of Thermo: that total energy (heat + P-V work) is conserved. By definition, the heat capacity of water at 15°C is 1 cal K-1 g-1 or 18 cal K-1 mol-1 (i.e., the heat required to heat 1 gram of water from 14.5 to 15.5°C is 1 calorie). The heat capacity is written with a subscript P or V depending on whether it obtains for constant pressure CP or constant volume CV. where and are the expansivity and compressibility--for solids the difference between CP and CV is minimal and can be ignored as a first approximation. For gases, CP = CV + R, and is quite significant. 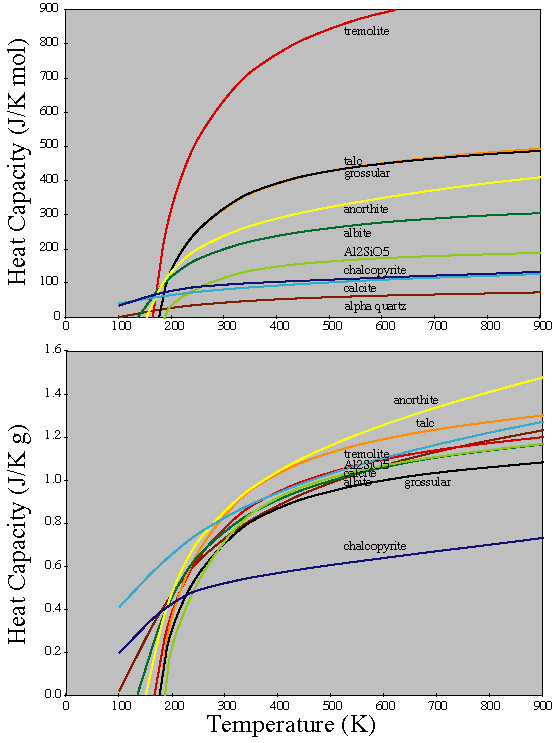 but there are other expansions for the heat capacity involving more or fewer terms. Below are some examples of heat capacities of minerals. 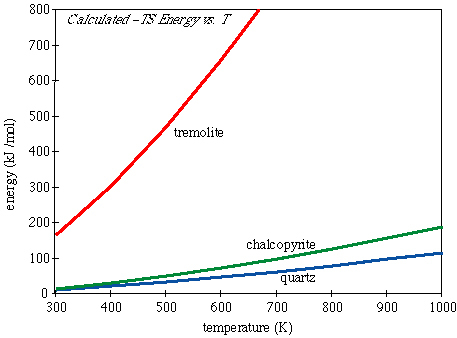 Note how silicates have a nearly constant heat capacity of ~1 J K-1 g-1 above 400K. We have already talked about the familiar concept of heat as energy. means that the enthalpy change is the heat change plus the energy the crystal gains by virtue of not being allowed to expand. Nowadays this will all be done for you by the software you are using. Thus, if we want to measure how the internal energy U of a crystal changes U with increasing temperature at constant pressure, we want to know H, and we can get that by integrating the heat capacity CP over the temperature range of interest. There's another way to measure H, though: calorimetry. By dissolving a mineral in acid and measuring the heat produced by the dissolution, we get a heat of dissolution (usually positive). The enthalpy of "formation" fH° of the mineral is then just the opposite of the heat of dissolution (usually negative). Exceptions to the "usually positive/negative" rule include CN, HCN, Cu2+, Hg2+, NO, Ag+, and S2-. 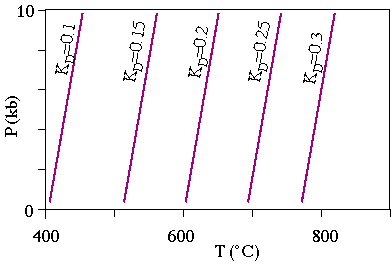 Enthalpies of formation appear in tables of thermodynamic data and are usually referenced to 298 K and 1 atm. rH° = fH°gypsum - fH°anhydrite - fH°water = -16.86 kJ/mol. a decrease in HP is also a decrease in UP. So far we know how to calculate the change in enthalpy caused by heating and we know that we can get enthalpies of formation from tables. What if we want to know the enthalpy of formation of a mineral at a temperature other than 298 K? In other words, forming quartz from the elements at 1000 K yields slightly less heat than at 298 K.
Compare this with the change in enthalpy H°298-1000 that results from heating quartz from 298 K to 1000 K, which we calculated is 45.37 kJ/mol. We have discussed the intuitive statement that reactions probably proceed because the reactants can decrease their internal energy by reacting. We also noted that internal energy scales with enthalpy, suggesting that reactions might 'go' because of a decrease in enthalpy. However, we then noted that not all reactions give off heat--some, such as the melting of ice, proceed in spite of consuming heat. Moreover, there are other processes that proceed in the apparent absence of any heat change: e.g., mixing of gases or the spreading of dye in water. What is it that causes these reactions to proceed spontaneously even if the heat change is zero or endothermic? The answer is entropy S, which is a measure of the order or disorder. Entropy has three sources: configurational, electronic, and vibrational. Electronic entropy arises when an electron in an unfilled orbital can occupy more than one orbital; e.g., for Ti3+, the single 3d electron can occupy one of three possible t2g orbitals and Selectronic = 9 J mol-1 K-1. 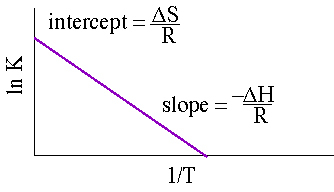 The entropy of a system always increases during irreversible processes; i.e., for a reversible process, dS = 0, whereas for irreversible processes dS >0. This is the Second Law of Thermo--better known as "You can't feed s**t into the rear of a horse and get hay out the front." In other words, the vibrational entropy can be found by integrating the heat capacity divided by temperature. However, because the rate of atomic diffusion also goes to zero at 0 K, all compounds have some zero-point entropy S°0. Entropy is thus the only thermodynamic potential for which we can calculate an absolute value. What we typically do is determine the heat capacity from near absolute zero to ambient conditions and then integrate it to get the (absolute) entropy (in fact this gives us only the vibrational entropy and ignores configurational and electronic contributions to entropy). Configurational entropy refers to the entropy resulting from imperfect mixing of different atoms in the same site in a crystal. The uncertainty associated with that probability is 0 if one outcome has a probability of 1, and a maximum when the outcomes are equally likely. ln = ln N! - ln(Npi)! where is the probability that a given number of atoms M in a given number of sites N will have a particular configuration. which says that G is the difference between the heat energy and the entropic energy. meaning that changes in Gibbs free energy are produced by changes in pressure and temperature acting on the volume and entropy of a phase. 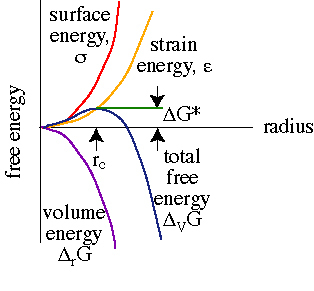 These relations indicate that the change in Gibbs free energy with respect to pressure is the molar volume V and the change in Gibbs free energy with respect to temperature is minus the entropy S.
and there is no reaction. Finally we have come to a satisfying point--we can now determine whether a given reaction will occur if we know H and S, and both of these are measurable or can be calculated. If rG < 0, the Gibbs free energy of the products is lower than the Gibbs free energy of the reactants and the reaction moves to produce more products. If rG > 0, the Gibbs free energy of the products is greater than the Gibbs free energy of the reactants and the reaction moves to produce more reactants. The negative value of G tells us that calcite has lower Gibbs free energy and that the reaction runs forward (aragonite calcite). So, the P-T slope of a reaction is equal to the ratio of the entropy change to the volume change. 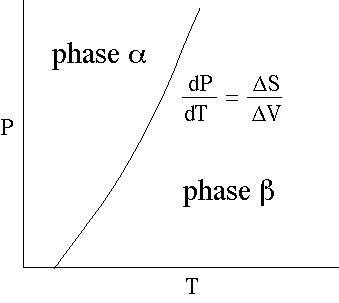 Alternatively, along the equilibrium curve, the changes in pressure times the volume change are equal to changes in temperature times the entropy change. This is the Clapeyron Equation. 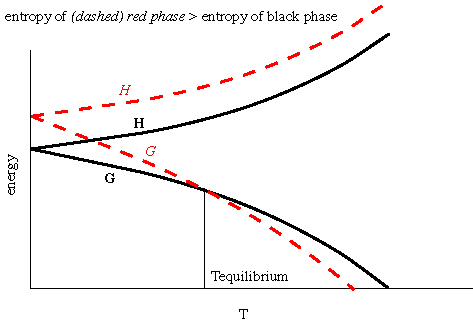 So, a phase diagram is a kind of free energy map. 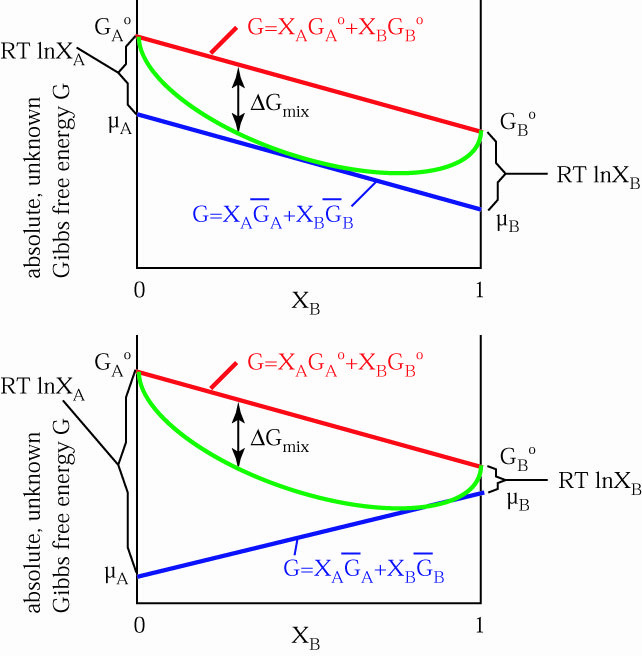 = along an equilibrium, < at high P and low T, and > at high T and low P. Along the equilibrium boundary the Gibbs Free energies of the reactants and products are equal and the Gibbs Free energy of reaction rG, is zero. Note that this considers only vibrational entropy and ignores configurational entropy. This means of solving for rG requires that you know rG at the reference temperature. If we had used the complete equation for solids, integrating the heat capacities, we would have obtained an answer of 9.86 kJ/mol--not horrifically different. Almost no phases are pure, but typically are mixtures of components. For example, olivine varies from pure forsterite Mg2SiO4 to pure fayalite Fe2SiO4, and can have any composition in between--it is a solid solution. We need a way to calculate the thermodynamic properties of such solutions. As a measure of convenience, we use mole fraction to describe the compositions of phases that are solid solutions. For example, a mix of 1 part forsterite and 3 parts fayalite yields an olivine with 25 mol% forsterite and 75 mol% fayalite, which can be written as (Mg0.25Fe0.75)2SiO4 or fo25fa75, etc. 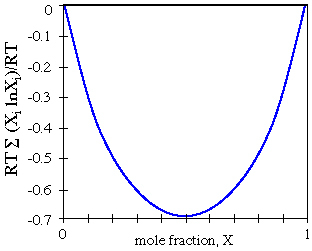 Mole fractions are denoted as Xi. and it is a linear mixing of the two endmember volumes. We call this ideal mixing or mechanical mixing. Real solutions, however, do not behave this way, and the mixing is always non ideal, although sometimes only weakly so. 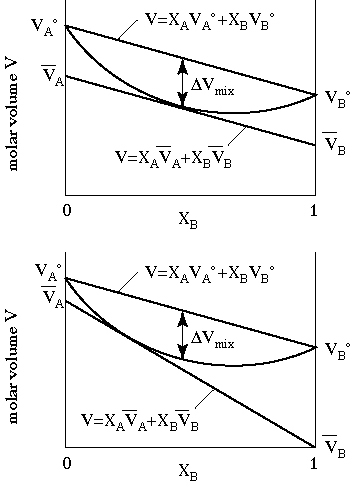 The figure shows mixing that produces a smaller volume than expected, but it is not possible to predict the shapes and positions of such mixing curves. in this figure, the molar volumes of the endmembers are VAo and VBo, and the partial molar volumes are A and B.
where i = 1..n is the number of sites over which mixing is occurring. 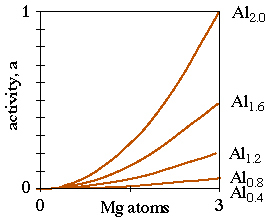 where AB is the interaction energy among A-B atoms, AA is the interaction energy among A-A atoms, and BB is the interaction energy among B-B atoms. 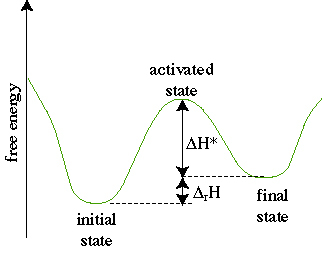 Recall that all spontaneous processes/reactions occur because of a decrease in Gibbs free energy. It should therefore not surprise you that the Gibbs free energy of mixing is always negative--otherwise mixing would not occur. The fact that A < G°A and B < G°B illustrates why compounds combine spontaneously--each compound is able to lower its free energy. The above figure is hypothetical because we cannot measure or calculate the absolute Gibbs free energy of phases. For this reason, is always expressed as a difference from some standard state measurement, as , - °, or - G°. 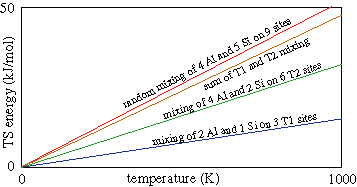 Depending on the relative values of Hmix and -T Smix, the free energy of mixing may be negative throughout the whole composition range if the entropic energy contribution outweighs the enthalpy increase; this is more likely at higher temperature. 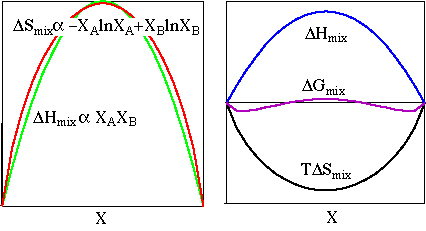 The two free energy minima in the above figure indicate that minerals of intermediate compositions can reduce their free energy by unmixing into two phases. This explains the appearance and driving force for exsolution. Note that this can only be true if Hmix > 0, i.e., if 2 AB > AA + BB, which makes sense because it means that the A-B bonds have a higher free energy than the sum of the free energies of separate AA and BB bonds. To be clear, ° is the chemical potential of the component in its pure reference state and varies as a function of pressure and temperature; this we measure with calorimetry. is the chemical potential as it actually occurs and varies as a function of phase composition; this we measure with an electron microprobe. The activity forms a bridge between idealized behavior and real behavior. and Q is the activity product ratio. The activities in the Q term change as the reaction progresses toward equilibrium. To be clear again, r ° is the difference in the Gibbs free energies of the products and reactants when each is in its pure reference state and varies as a function of pressure and temperature. r is the difference in the Gibbs free energies of the products and reactants as they actually occur and varies as a function of phase composition. K is called the equilibrium constant. If K is very large (ln K positive), the combined activities of the reaction products are enormous relative to the combined activities of the reactants and the reaction will likely progress. On the other hand, if K is small (ln K negative), there is unlikely to be any reaction. Where ajadeite is the activity of NaAlSi2O6 in clinopyroxene and aalbite is the activity of NaAlSi3O8 in plagioclase. although we will not go through the derivation. The form of a cubic ideal activity model is shown in the above figure. there are four possible end member components A Y , A Z , B Y , and B Z .
where the X3 term describes mixing on the 8-fold trivalent site and the X2 term describes mixing on the octahedral divalent site. 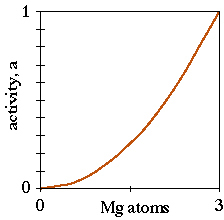 The pyrope activity is shown in the above figure for Mg from 0 3 and Al from 0 2. It is common to modify such models--that are based on completely random mixing of elements--with models that consider local charge balance on certain sites or the Al-avoidance principle. 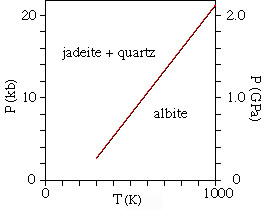 This equation implies that the activities of the Fe and Mg components of biotite and garnet are a function of Gibbs free energy change and thus are functions of pressure and temperature. which describes the high-pressure breakdown of anorthite. 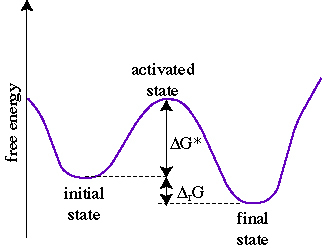 When a system passes from an initial to a final state it must overcome an activation energy barrier G*. It is not easy to generalize about the activation entropy S*, however, in general, reactions with positive entropy change rS are faster. For example, evaporation is faster than condensation, melting is faster than crystallization, and disordering is faster than ordering. i.e., if f << 1, few atoms have enough thermal energy to overcome the activation energy barrier, whereas if f = 1 all atoms can overcome the activation energy barrier. where k is Boltzmann's constant, and h is Planck's constant. 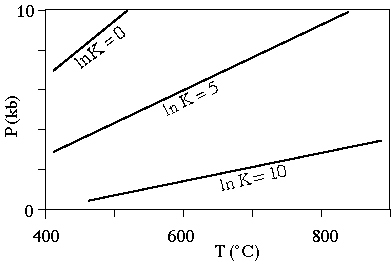 Thus, the rate at which atoms jump is related to temperature and to atom-scale processes described by k and h.
These different energy contributions yield an increase in total free energy up to a certain radius termed the critical radius, beyond which the total free energy decreases. 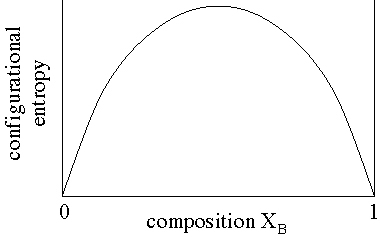 Following nucleation, grains of the product phase(s) grow to replace the parent phase(s). Either the reaction is polymorphic, or atoms of the parent phase must dissolve, be transported, and then attach themselves to the product phase. The rate of growth is thus controlled by the rate of the slowest of these three steps, and is described as either interface controlled or diffusion controlled. where is an "interface jump distance" and the rest you will recognize from previous equations. 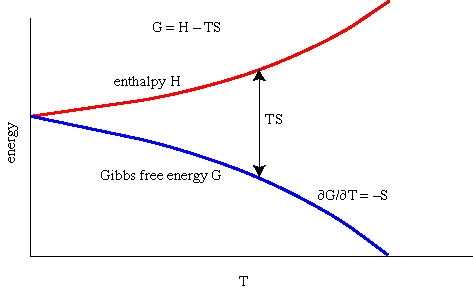 The [( - rG/RT)] term indicates that the rate of growth depends on the Gibbs free energy change of reaction. As rG 0, this term also approaches zero. As rG , this term approaches 1. Laumontite is the phase that is stable at the lowest P and T. Wairakite is the next phase to form, and it does so via the reaction laumontite _ wairakite + H2O. At higher temperature wairakite + H2O decompose to anorthite + quartz + H2O. Kinetic experiments conducted on the reaction laumontite _ wairakite + H2O, using crystals of laumontite suspended in H2O, reveal the transformation vs. time data in the figure above. The activation energy for growth apparently varies from ~196 kJ/mol to ~ 72 kJ/mol depending on the reaction mechanism. The growth rate data can be combined with similar nucleation rate data to yield a complete transformation rate equation that can be extrapolated to geologic conditions of interest. The figure below shows extrapolated growth rates (m/s) for the laumontite _ wairakite + H2O reaction.